Students in grades 1-3 enjoyed creating these fantasy Castles. 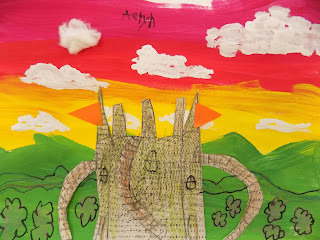 This lesson was inspired by a lesson I saw over at www.cassiestephens.blogspot.com. I loved her "Tubular Castles"lesson. We began by discussing color harmony and how to achieve this with an analogous color scheme. Students chose to either paint hills or water in the foreground. The second week I set out texture plates and drawing paper and the students created a rough surface on the paper. 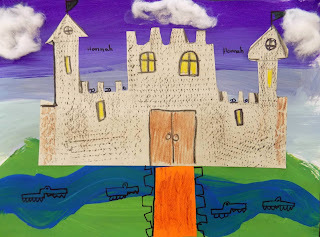 Black crayons were used to draw their castles which were then cut out and glued to the background. We discussed symmetry and briefly how to draw the windows to prevent invaders from entering the castle's. Cotton balls were used for the clouds. We discussed density and how we could stretch the cotton balls to create soft fluffy forms in the background. If you're looking for a collage type lesson this would be a great place to start. Labels: Color harmony, warm/cool colors. Art with elementary students. 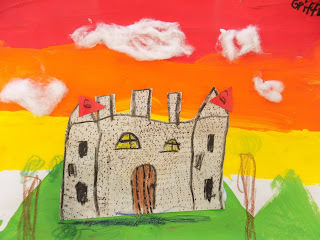 Castle art with children. Texture lesson with children. 3-D art. multi media art lesson for children. Multi cultural art lesson. Spectacular! These are so lovely. So bright and happy. Thank you I appreciate the compliment. As I said the children really enjoyed this lesson.